Horse whisperer Shane Stryker is done with passion. This time round, he’s determined to meet someone who will be content with the quiet life of a rancher’s wife. And the fiery, pint-sized redhead who dazzles him at the local bar definitely does not fit the bill. Small town librarian Annabelle Weiss has always seen herself as more of a sweetheart than a siren, so she can’t understand why Shane keeps pushing her away. Shane has formed the totally wrong impression of her but only can help her with a special event for the next Fool’s Gold festival. 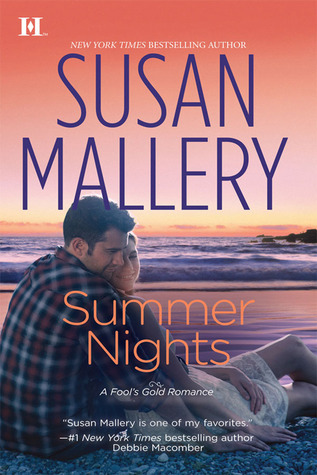 And maybe while he’s at it, she can convince him to teach her a few things about kissing on hot summer nights, too – some lessons, a girl shouldn’t learn from reading a book. Like the other books in this series it was very enjoyable. In many ways a good old fashioned romance. This is Annabelle’s and Shane’s story, we met them in the previous book as this is the second in the 2012 trilogy. I think why I liked this book was because of all the animals, they were such fun. I like animals in a romance story, they just give that added dimension to it, and make it just that little bit more heartwarming. I loved Khatar the “mean” horse that falls for Annabelle, and of course then there is an elephant and more horses, an unwelcome pony and a pig…. and the list goes on! The romance was one of those on and off again romances with little hiccups along the way. Shane is attracted to Annabelle, but both of them have past relationships that went sour, and so it takes sometime before trust is established. One part that just did not work for me was when Annabelle’s ex showed up with some news that to me seemed more of a filler than anything. My opinion is that it did not heighten the tension or advance the plot. When I had finished reading that part I thought, really…. !